The term protective trust has no particular legal meaning. When we use the phrase we are referring to a type of trust where provision is made for a disabled child where the disabled child is the only person capable of receiving benefits from the trust during the lifetime of the disabled child and the only discretion is how much will be spent upon the child. In providing for a person who has a claim against your estate it is not wise to provide for that person, particularly a disabled person, by utilising a testamentary discretionary trust. The difficulty with a testamentary discretionary trust for a disabled child is that the disabled child will not have control over the trust because the disabled child lacks legal capacity and the disabled child will not be the only beneficiary of the trust. 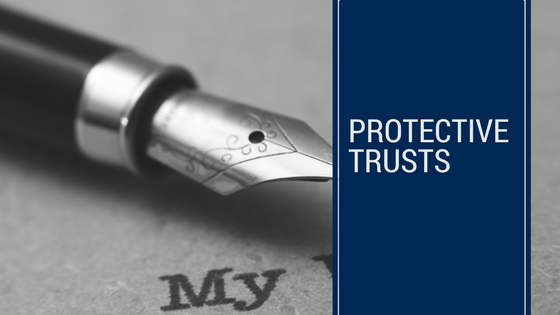 Therefore, there is a risk that whoever is in control of the testamentary discretionary trust will not make provision for the disabled child even though implicitly it is understood that the controller of the trust is expected to do so. The law recognises this risk and therefore such arrangements that make provision for disabled children in such format will easily be undone by the court in a Family Provision claim brought on by the Public Trustee or others. We should say, such restriction in providing for a disabled child would not be upon say a grandparent, an aunt or uncle or a sibling who could more flexibly provide for a disabled child through a testamentary discretionary trust.